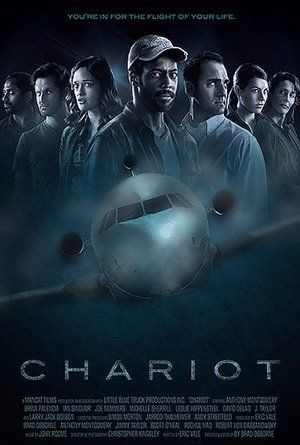 “You Have Been Chosen.” A 2013 Independent film directed by Brad Osborne and written by Eric Vale, Chariot is a thriller about 7 strangers who wake up on an airplane. Having no idea how they managed to get there, they later discover that the United States is under attack and there is no place they can land. The film is titled “Chariot” as the passengers have been unwittingly placed in a government program with that name. The program itself references the Ancient Greeks, who would send their most valuable citizens on chariots and send them to safety when under attack. However the passengers mostly consist of “Average Joes”. To make the situation worse, they are cut off from the cockpit, having no idea who the pilot is, and they are flown into Security Airspace, making their danger far more imminent.